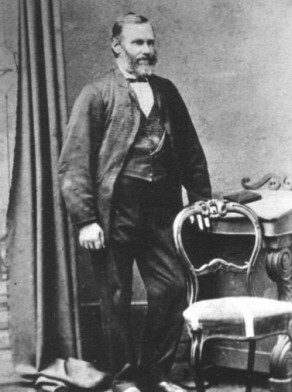 Alfred Tye was born at Rlvenden, Kent, England in 1818, son of Thomas Tye and Mary nee Tamsett. They arrived in Sydney on the Cornwall in August 1839. In 1841 he married Harriett Hoad at Sydney, a union that produced five children. After her death on 1 November 1869, aged 56 years he married Mary Brown at St James Church, Sydney on 10 February 1870. Alfred Tye died at Glebe on 13 July 1878, 59 years. Mary Tye died in 7 February 1893. His brother William and nephew Thomas served as aldermen on Newtown Council. Alfred and brother Richard learnt the craft of brickmaking in Kent from their father. Alfred was making bricks at St Phillips, Glebe in 1852, at Waterloo in 1855, and entered into a partnership with brickmakers and potters Frederick Goodsell and Enoch Hughes. These innovative men developed steam-operated brick moulding machinery in 1870, and were the first to do so, and defying convention by making shale-plastic bricks. Tendering for work in 1869 from the Kentish Hotel, Glebe, of which Tye had become the publican, he combined hotelkeeping with brickmaking still in partnership with Goodsell. He left an estate valued at 1,500 pounds. A prominent member of Glebe Volunteer Fire Brigade, fireman joined Glebe aldermen at Tye’s funeral at Balmain Cemetery.On his election in July 1875 Tye promised Bishopthorpe electors he would ‘do his utmost to have the money of ratepayers’ expended equitably throughout the municipality. The Tye family were still retained the 99-year lease of the Kentish Hotel in 1911. Alfred Tye’s main source of trade for the Kentish Hotel, on the corner of Parramatta Road and Derwent Street, was the passing trade along Parramatta Road. Glebe supported 26 pubs in 1878 when concerned citizens organised a public meeting at the Glebe Road Wesleyan Church which resulted in a deputation to the Attorney General urging him to take steps to restrict the number of pubs.